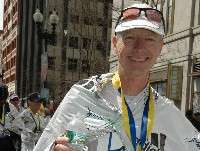 Thank you for your interest in receive the Middleagemarathoner.com newsletter & our communications. We work exclusively with middle age athletes, whatever their experience, athletic ability or goals. We aim help you overcome your biggest frustrations and challenges when it comes to running & your training. To subscribe to our newsletter & communications and continue to receive updates, tips and helpful information exclusively for middle age runners, please enter your first name and e-mail address below. Middleagemarathoner.com will use the information you provide on this form to be in touch with you and to provide updates and marketing. We will not spam you with promotional offers, nor will give your name & e-mail address to anyone without your express consent. We won't send you spam. You can unsubscribe at any time by clicking the “unsubscribe” link our e-mails.